‪#‎Together4Peace‬ ‪#‎UN‬: International Day of UN Peacekeepers 2016. "Today we honor the near 3,500 who have given full measure for the flag of the United Nations, united under a common cause regardless of religion, nationality, race, color, sexual orientation, or any other [dividing] labels bestowed upon fellow Human beings, to maintain peace and safety around the world," stated Kentucky Equality Federation alliance secretary-general Jordan Palmer. "The organizational and operational skills that our Army has, to include our Army Reserve, is so valuable in an environment where you have [the militaries of] 44 different nations ... trying to come together and function as one," stated U.S. Major General Hugh Van Roosen, the United Nations Force Chief of Staff, was responsible for the daily operation of the 44 country multinational staff serving over 15,000 United Nations Peacekeepers. 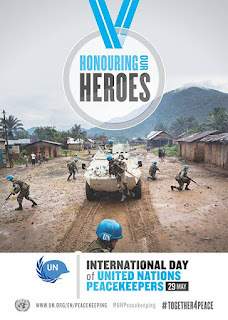 Since the first UN peacekeeping mission sixty-eight years ago, civilian and military personnel of the United States have served together under the United Nations flag in cooperation with peacekeepers from around the world, strengthening and deepening the bonds between themselves. When I first learned as a kid what the United Nations (UN) was, I always felt it would be an incredible opportunity to work for the U.N.,” said Van Roosen. "It's the concept of the United Nations that is so great- although there are challenges and difficulties, the underlying concept is truly the future for our planet."